Get Involved | Holly House Inc. 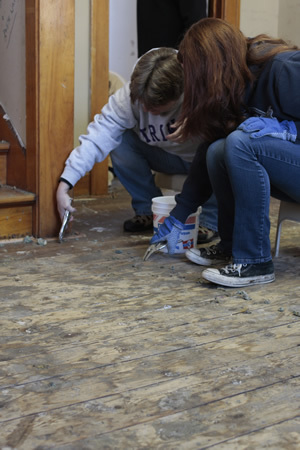 There is much to be done with rehab and renovation efforts. Financial donation is most crucial to the organization now, but there are many other ways to help! See the information below for details. If you are interested in getting involved, be it with donation, with volunteering, or if you or your business want to sponsor or host a fundraiser, please contact us! We would love to hear from you. Connect HOLLY House with your church or place of worship for physical site projects and the opportunity for the agency to present its services and mission. Ask us to speak at your group or business. HOLLY House is partnered with its very own student volunteer group at The College of Wooster, HOLLY House Student Organization (HHSO). HOLLY House partnered with the local Habitat for Humanity chapter to complete the siding of the agency building, as well as with several youth groups at surrounding churches to complete various pre-construction tasks.